First, a confession: formal gardens aren’t really my personal favorites. I enjoy including tightly clipped evergreens in a mixed border, to provide contrast to plants with looser habits, but it’s rare that I design gardens ruled by axial symmetry and carefully shaped trees and shrubs. 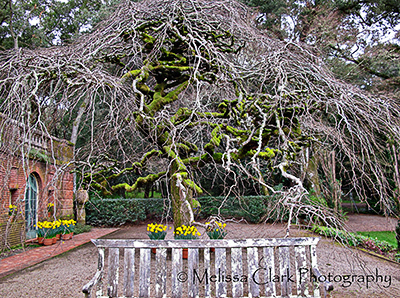 Having said that, I must admit I enjoyed visiting Filoli Center on my third “winter road trip” in February. 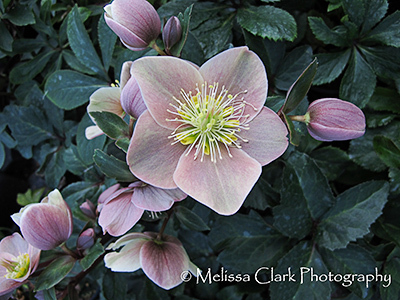 I was in the area for a visit with my son and had spent some time at a small but lovely community garden in Palo Alto, the Elizabeth Gamble Garden, when I decided to head for Filoli the next day. 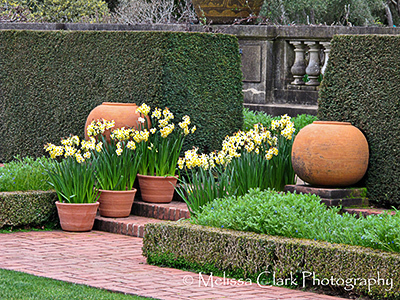 Filoli, which is in the care of the National Trust for Historic Preservation, was created as a grand country house and garden for the Bourn family in Woodside, CA beginning in 1915. Eventually it passed into the hands of the Roth family, which gave it to the Trust in 1975. After paying my entry fee, I didn’t even bother to visit the grand house (cretin that I am) but headed straight for the gardens, which range from natural-looking meadow areas to yew allees and trees that have been pruned into formal shapes like nothing I have ever seen. 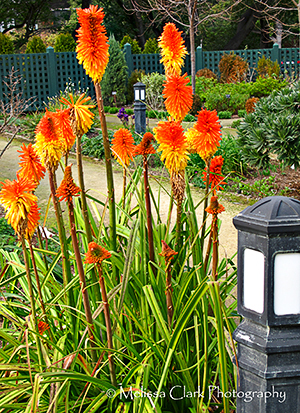 The biggest splashes of color in the garden, in mid-February, came from hundreds of pots of forced bulbs, primarily daffodils, scattered through almost every area of the garden. 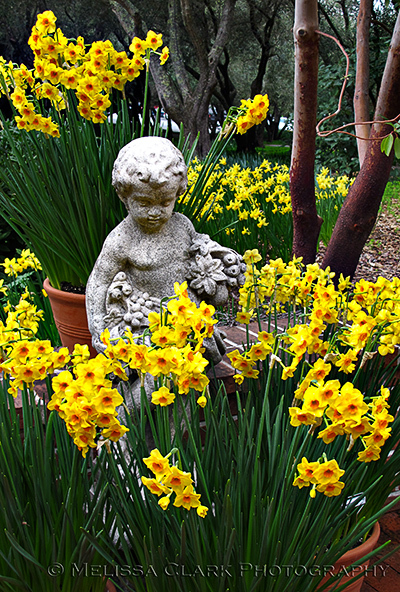 A cherub surrounded by Narcissus greets visitors near the entrance at Filoli Center. 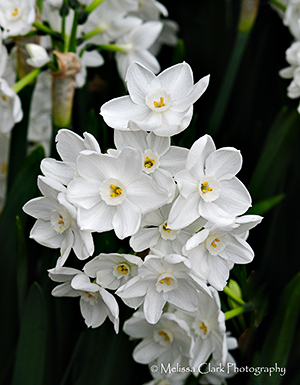 A fragrant white ‘poeticus’ daffodil was only one of many kinds on display in containers at Filoli. Within the Walled Garden, I saw volunteers working in an area called the Chartres Garden, where low-growing annuals in yellow and blue hues surrounded hybrid tea roses that had been pruned back, awaiting spring. In the background, geometric yew cones and cylinders and meticulously pruned hedges provided an eye-catching contrast to the rounded boxwoods in the rose beds. 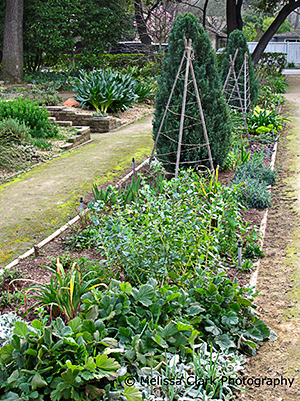 In the Chartres Garden, a wheelbarrow and tools testify to the year-round efforts of the garden’s workers and gardeners. 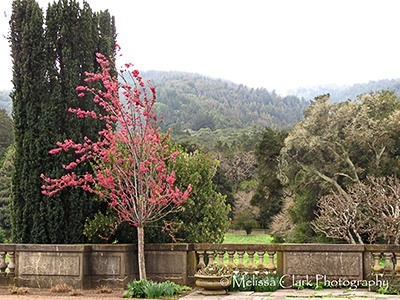 Camellias in bloom provided the other primary source of color in the early spring of northern California at Filoli. 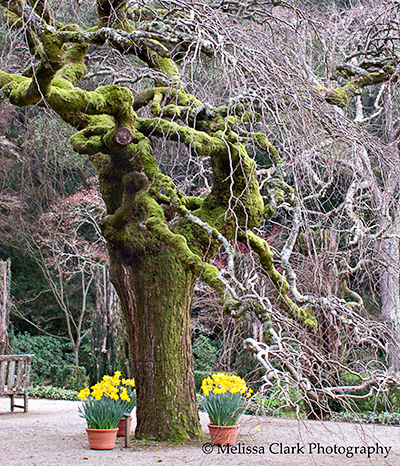 Behind the pool area in the Sunken Garden, an enormous Camperdown elm (Ulmus glabra ‘Camperdownii’) dominated a large seating area, surrounded by pots of daffodils. I couldn’t tear my eyes away from its sweeping, arching branches, many of which were covered in moss. 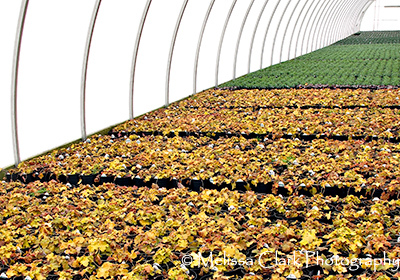 I can only imagine how beautiful it must be during the growing season. The Sunken Garden area itself is dominated by a large cylindrically-pruned silver-barked tree unfamiliar to my East Coast eyes, possibly an olive tree pruned “in a formal goblet style” (see Filoli’s website for an extensive and detailed discussion of the garden’s design and influences). Setting it off is a grouping of enormous upright yews. 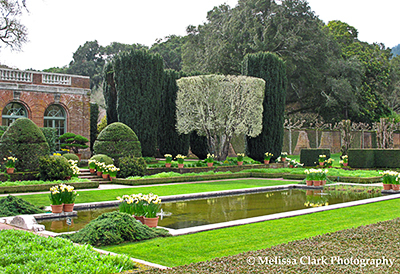 The Sunken Garden area at Filoli, with the Garden Room in the background. Adjacent to the sunken area, moving toward the house, again you see pots of daffodils everywhere, marking the transition to a terraced area from which there are vistas down into wilder, meadow-like areas. 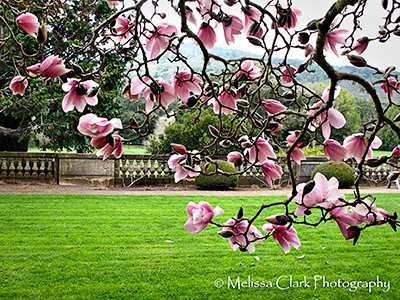 Saucer magnolias in bloom on the terrace at Filoli. 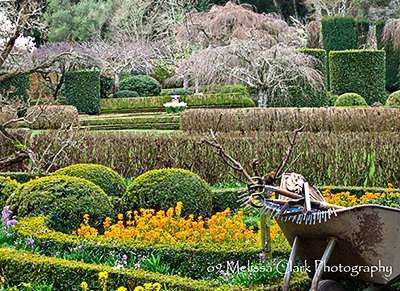 A view from the terrace at Filoli to a meadow area beyond. According to information on Filoli’s website, as the planning for the gardens and house began, a wheeled tower was constructed to identify the best vantage points for the garden for capturing views of the surrounding mountains and lake. What a great idea! 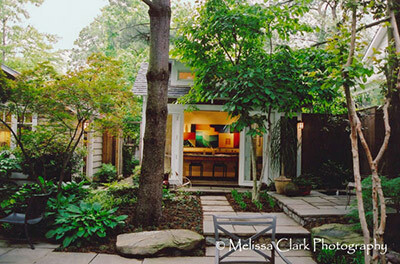 As I’ve noted before, views are critical in designing a garden. The Bourns understood this, even without the help of any formally-trained landscape designers or architects to help them. And the name “Filoli” – where did it come from? From the first two letters of “FIght – LIve – LOve.” “To fight for a just cause; to love your fellow man; to live a good life” was a credo that Bourn believed in. Not bad for a life, or to inspire the birth of a remarkable garden. 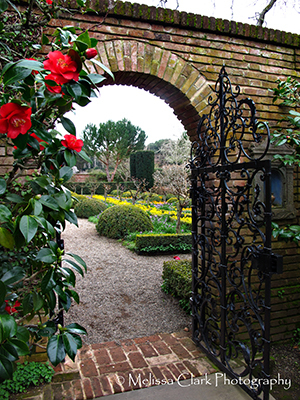 Filoli Center is open to the public Tuesdays through Sundays from February to the end of October. For more information on its history, admission, and special programs, visit its website. Several weeks after my Winter Road Trip Part 1, I headed west – far west – to visit my younger son who is in college in northern California. Before leaving I decided that I would spend some of his class time visiting some gardens within easy driving distance. First stop, the day I arrived: the Elizabeth Gamble Community Garden in Palo Alto. The Gamble Garden is a non-profit community horticultural foundation, with two and a half acres of gardens for strolling and enjoyment. It’s tucked away in a residential neighbhorhood – not surprising, since it was once the private residence of Miss Elizabeth Gamble. Elizabeth, whose father was a co-founder of Procter & Gamble Co., spent one year at Stanford before transferring to Wellesley for the rest of college. Having no doubt realized the error of her ways in terms of climate (! ), she returned to Palo Alto after college and spent the rest of her life in the Gamble house. 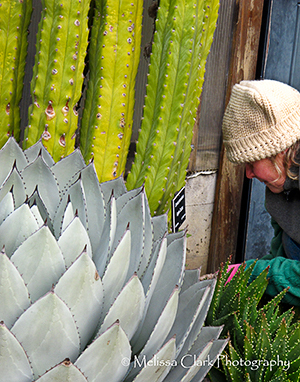 Her gardens became well-known and she enjoyed sharing them. Any photographer loves to find a public garden that is open as early as you can get there, because of better light in the early morning and late afternoon hours. The Gamble Garden is one of those, and admission is free, with access for disabled persons. In short, a wonderful gem to find. There are demonstration gardens, a gazebo, and even the occasional wedding on site! Here’s what caught my eye the day I visited with my trusty point-and-shoot. 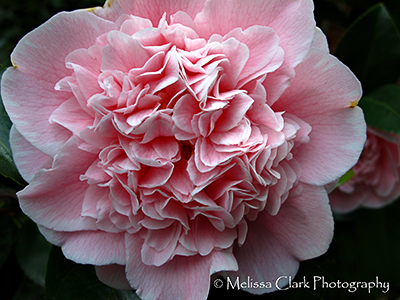 Camellias were in bloom throughout the garden. Here is one of my favorites. Island beds were green and surprisingly full, even in February. Mixed herbs and perennials in a rectangular bed. Chartreuse euphorbia blooms brighten up a sea of green shades in the garden. 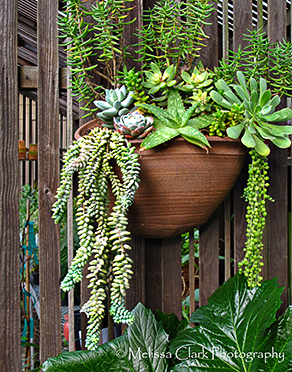 Finally, there were the succulents. 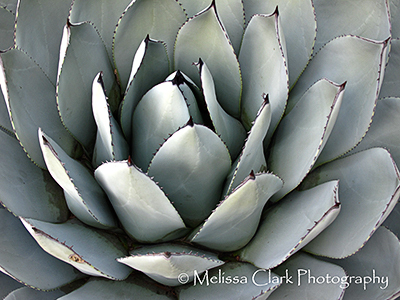 Agaves and sempervivums made me wish to be a California gardener – if only temporarily. 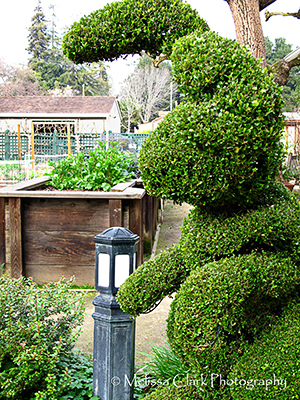 So if you ever find yourself in Palo Alto, take a detour to this garden. Waverly Street, where it’s located, is full of beautiful gardens as well. I’m looking foward to visiting in another season. If winter is like this, the rest of the gardening year must be stunning indeed. 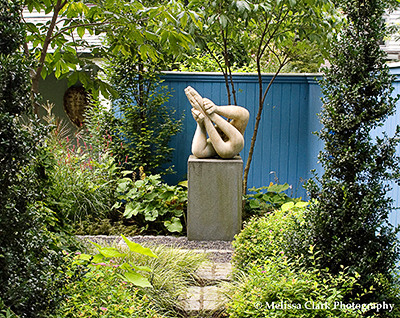 A private garden in Potomac, MD welcomes visitors on a 2009 Open Days tour (Nikon D300). As I write this, I am trying to block out the fact that about 50 linear feet of copper gutters recently ripped off the back of my house, a lingering present from Snowmaggedon 2. So I decided to listen to Mr. Borland and think about spring and the Garden Conservancy’s Open Days tours. My first visit to a local garden open through the Garden Conservancy’s Open Days program was in Arlington VA, to a garden designed by Tom Mannion, APLD. It seemed pure magic to me. And the owners were on hand to talk about the garden and how it was created. The back yard of an Arlington VA garden as it appeared on tour during the Garden Conservancy's Open Days Program in 2004 (Nikon N80). The patio area between two studios (Nikon N80). I was hooked. Then, for a couple of years, there were no gardens open through the Open Days program in our area. 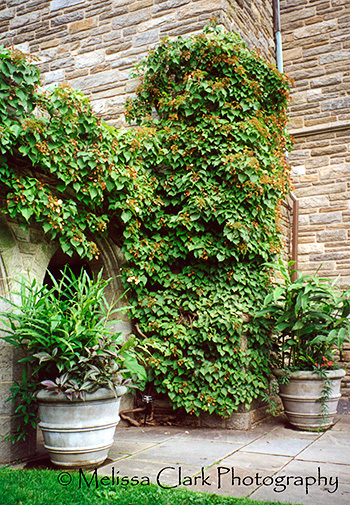 So, en route to my Hudson River Valley trip in 2004, I decided on the spur of the moment to stop in Nutley, NJ on a hot August day where I had learned there would be a fabulous garden open. When I arrived at the location, I discovered not one, but two amazing Garden Conservancy gardens right across the street from each other. 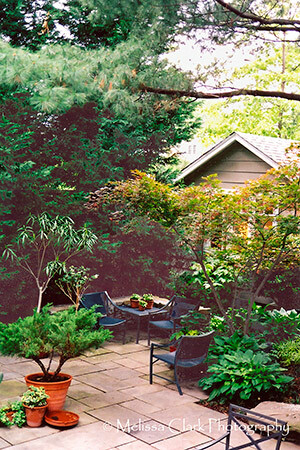 Both were designed by Richard Hartlage, a well-known landscape designer, author and photographer. The smaller of the two gardens, belonging to Graeme Hardie, was a masterpiece of getting the most out of a relatively small space, with numerous level changes. 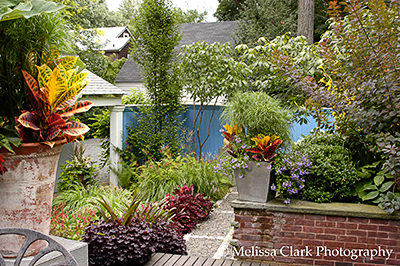 It was absolutely full of color, beautifully planted containers, and colorful walls, creating a tropical feel. 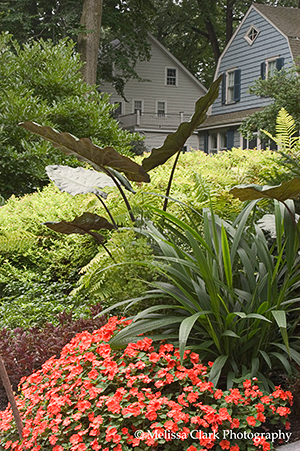 Sculpture greets visitors as they enter the Hardie garden (Nikon D100). 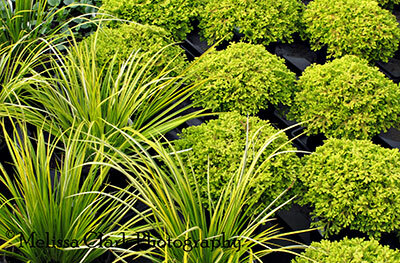 The multi-level design makes the garden seem larger than it is (Nikon D100). 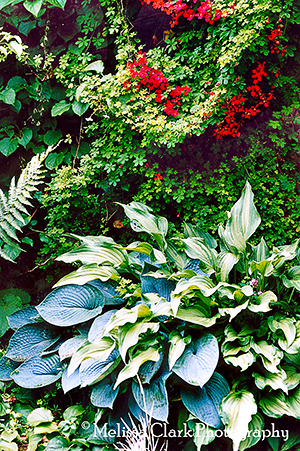 Across the street, Silas Mountsier’s one-acre garden was almost overwhelming. 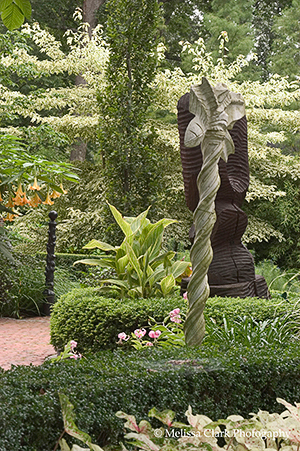 Large sculptures are dotted throughout the garden. Hartlage, who is based in Tacoma, Washington, was actually on site for the day, talking to visitors about both gardens and his plans to expand Mountsier’s even further (which I understand has occurred since my visit). The front yard of the Mountsier Garden is boldly accented with tropicals and annuals (Nikon D100). Abstract sculptures in the small patio at the Mountsier garden, with Datura in the background (Nikon D100). 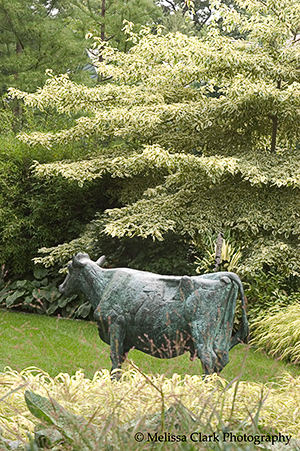 A large cow sculpture with a Cornus controversa 'Variegata' brought by Hartlage as a five-gallon specimen when the garden was first planted (Nikon D100). Wherever you live, there’s a good chance that there will be one or more Open Days in your area this year – the Conservancy’s program is expanding and new areas are added all the time. Consider joining the Conservancy; you’ll receive a free copy of their 2010 Open Days directory (I’ve met gardeners who plan their vacations by it!). Or sign up for information by e-mail about GC events. The GC has many stunning large-scale projects they’ve helped to fund, including the restoration of the gardens at Alcatraz. 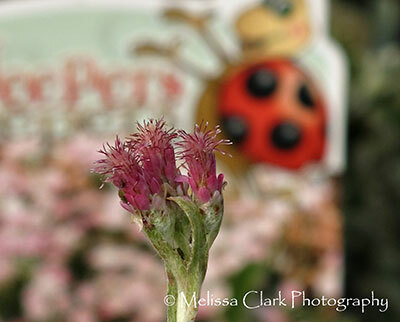 Check out their schedule to see what’s available – and stay tuned here, as I write more in the coming months about what’s in store for gardeners in the DC area this year under the Open Days program. 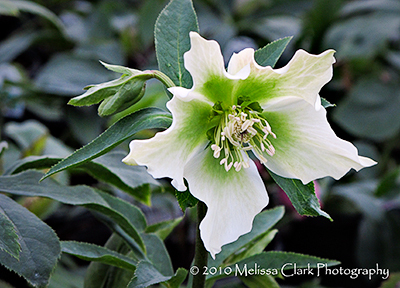 Photos from the DC area’s Open Days 2010 program are featured in my book, The Garden Is Open. For a preview of the book or to purchase it, visit the “My Books” page. 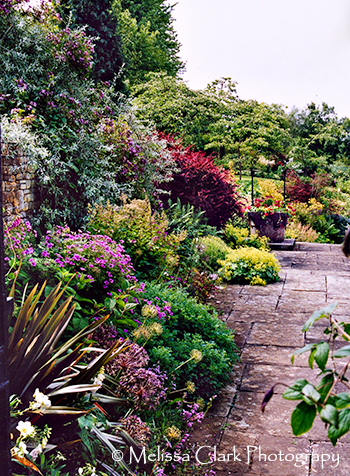 In the summer of 2002, I took a memorable trip to visit some of England’s great gardens. My tour group visited such iconic destinations as Sissinghurst and Hidcote, Great Dixter, Kiftsgate and Wisley. As breathtaking as those gardens were, however, equally memorable and special were the private gardens we visited. 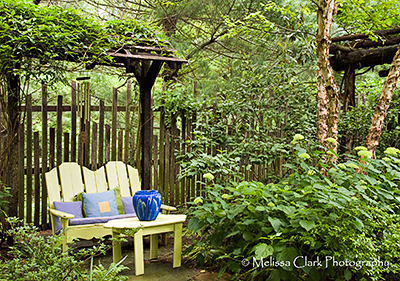 Most – listed in the famed “Yellow Book” – were open through the National Gardens Scheme, from which our own Garden Conservancy organization draws its inspiration. Here is one of my favorites. Brook Cottage is a testament to the hard work and vision of a gifted plantswoman, Katherine Hodges, and her late husband (an architect) over a period of more than 35 years. Located on a hillside in the west-facing slope of a valley in Oxfordshire, the site originally consisted of rough pasture divided by old hedges. The Hodges originally purchased the site’s 17th century house as a weekend cottage in 1964 and eventually retired there. Near the house, the landscape has been designed to link level areas of lawn and terrace with the natural slopes and to create enclosures with a series of yew and copper beech hedges. Hostas and nasturtiums at Brook Cottage near the house. Mature trees and shrubs have grown to connect the garden with the surrounding countryside. There are herbaceous borders, a bog garden, more than fifty varieties of clematis and an extensively planted ‘hanging garden’ of roses, including species, old cultivars, and modern varieties. 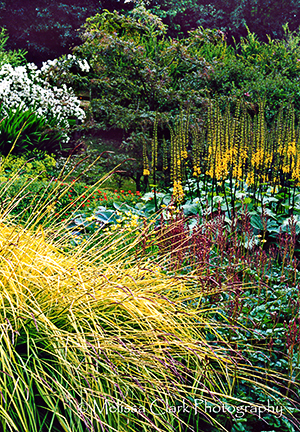 The bog garden at Brook Cottage, with Ligularia 'The Rocket' in the background and Acorus 'Bowles' Golden' in the foreground. Brook Cottage’s garden is open to the public, through Britain’s National Gardens Scheme, most weekdays from Easter to the end of October. At the time of our visit, Mrs. Hodges tended the plantings herself, with the help of one full-time assistant; I saw her trundling a wheelbarrow near one of the herbaceous borders, deadheading blooms, as we visitors wandered around, mouths open. This is a remarkable, memorable garden, not to be missed. Do visit it if you can. 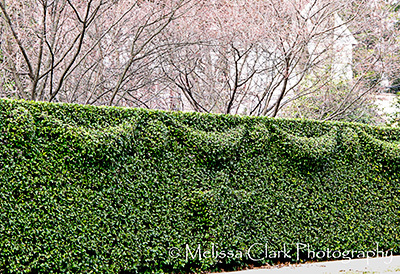 In late January, as our local Garden Conservancy Open Days committee was finalizing its selections for the 2010 Open Days tours in the DC area, we found ourselves walking down a street in the District with an amazing hedge. Two of the designers among us (pas moi, I can’t tell an American holly from anything but a Foster) thought it was a hedge of American holly. 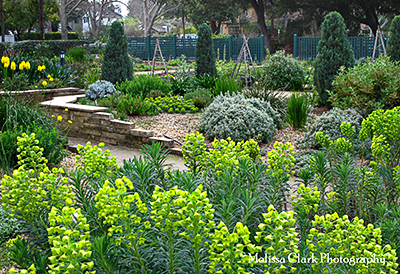 It was beautifully maintained and its crisp, deep green color was a welcome addition to the winter landscape. What really impressed us, however, was the fact that some talented gardener had carefully pruned it to include a repeating pattern of swags and circles along its upper regions – punctuated with stars every so often. The photo doesn’t do it justice. 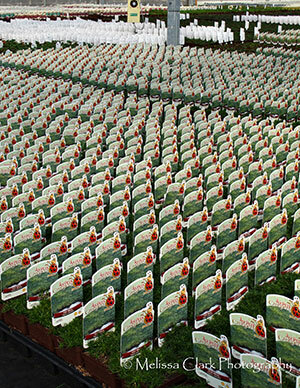 Slanting afternoon light, peeping in and out of the clouds, raked across the tops of the swags, making them stand out when the light was best. Seeing this work of art – for that’s what it was – made me think of other walls I’ve seen adorned with living art. Most of them are expanses of brick or stone, either house walls or retaining walls, that have been softened with flowering shrubs or (less often) trees. Sculpting shapes out of climbing plants can be relatively easy (see the inverted ivy “V” shapes below) or more challenging (think thorny pyracantha, sorry, no photo available). Definitely less appealing than the stars and swags hedge above, but much better than the unadorned brick retaining walls would be without the ivy. 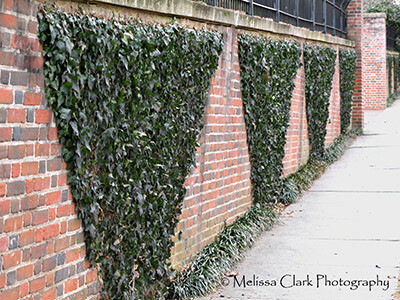 At the Australian Ambassador's residence in Washington DC, inverted "V" shapes of ivy break up a large expanse of brick retaining walls (Canon G11). 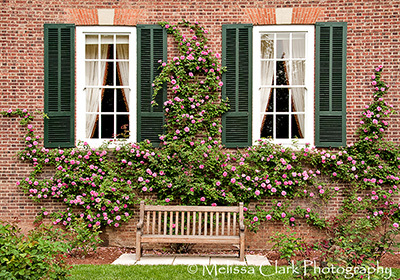 Much more appealing is this espaliered climbing rose on the walls of the garden at the British Embassy, which was open to the public for a day several years ago. 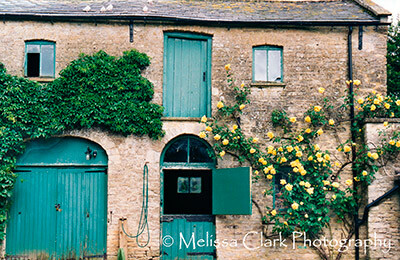 In England on a tour of public and private gardens in 2002, I saw how even a lowly barn wall can be transformed by climbing roses and evergreen plants. Trees are harder to use as wall sculpture. 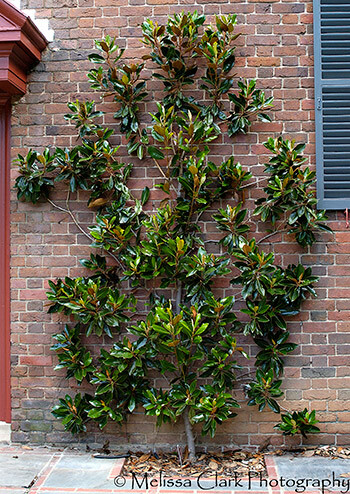 In addition to fruiting trees, Magnolias are favorites of garden designers for this purpose. I’ll close with my favorite living wall adornment. At Swarthmore College, the entire campus is a renowned arboretum. It was here I first encountered a cousin of the climbing hydrangea, Schizophragma hydrangeoides, or Japanese hydrangea vine. 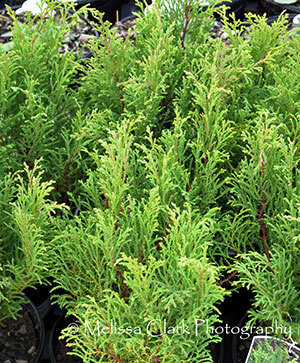 I love this plant because it will flower in shade and grows relatively quickly; a few years ago I planted it on my north-facing front wall. Here it is in flower at Swarthmore. Thank goodness I had my camera. Japanese hydrangea vine in flower at Swarthmore Arboretum (Nikon D100). This morning, after uploading the Plant Combinations post via iPhone from my bed, under four comforters, I forced myself up and wrapped my already fully-clothed self in a shapeless but heavy terrycloth robe. In the kitchen, I could see my breath. Time to leave the house, I decided. I will not bore you with the details. I am writing this from the comfort of a Hilton GARDEN Inn (I thought the name was appropriate, but more importantly, they had rooms available when I called) a couple of miles from my cold, now deserted house. Before I left I took some photos with my iPhone and Canon G11. Then I walked into downtown Bethesda and took some other photos, some of snow and some just colorful snaps to cheer myself up. Here they are, in no particular order. I promise to return to garden designer/photographer mode soon, but for now I am just glad to be warm again. They’re predicting another round on Tuesday – spare me!